How much does your hannukiah weigh? Enough to break the ice! Holiday celebrations are one of my favorite ways to build community, and Hanukkah is no exception. Hosting a Hanukkah celebration brings back so many positive memories: lighting our own menorahs, eating latkes, and cheating my non-Jewish grandfather out of dreidel winnings because we played with real money. I am not originally from Chicago, and I use MHWOW to create Jewish spaces for friends who can’t go home for the holidays. This often creates a group of people from many different parts of my life who don’t know each other. Does this sound familiar to you? Or do most of your guests know each other already? Check out the list of icebreakers that could work at your Hanukkah party this year. Which TV character would you like to have dinner with? If you are hosting a Hanukkah party for more than 12-15 people, Human BINGO is an easy way to get people talking and moving. I often find that people bunch together with their friends in one area of my apartment and don’t move for the rest of the night. Because they are expected to complete as much of the bingo board as possible, they have to go from person to person. You are the one creating the BINGO board topics, so you also have complete control on what you want your guests to talk about. Find someone with the same number of siblings as you and ask about them. Find the person who has traveled to the most amount of countries. Find someone who went to Jewish summer camp and ask them for their favorite memory. Find someone who wants to try a new restaurant in your neighborhood and pick a date to do so. Once your guests have found someone and chatted, they can sign each other’s bingo board. Logistically, you can either have this activity running through the entire party by distributing boards and pens as people are arriving or facilitate directly in the middle of the program. If you would like the activity to run more organically, be sure to include instructions at the top of the page for people to understand the activity (MHWOW funding can be used for printing costs! ), and don’t forget to purchase a prize! This easy game requires a little set-up before your program, but is very easy for your friends to do on their own in different group sizes. I have found M&M’s and Skittles to work the best for this icebreaker, but you could even buy Hershey’s kisses and place a colored dot on the bottom of the candy wrapper. Set up the candy in places where people naturally congregate in your home. As people are snacking on them, encourage them to answer the question associated with the color. You can easily make instruction cards out on the table to outline each question. I like this activity because people can participate as much or as little as they want. And people’s answers usually turn into interesting stories if you ask the right questions. Family/Friends: What is the craziest thing you have done with your best friend? Favorites: What is your favorite book from childhood? Firsts: What was your first day of school tradition as a kid? From: What is your favorite part of your hometown? What is your hometown known for? Fun: Would you rather go skydiving or climb a mountain? Future: Where would you like to live during your lifetime? What if I have a lot of new people in the room and want to facilitate group bonding? The best part about this game is that you can start at any age – either one that has passed to share a memory or an age in the future to talk about what you hope to achieve/have/be! This activity is best for a smaller group – between 6 to 8 people – because we want everyone to participate. You might lose enthusiasm or desire to participate if it takes too long to go around the entire circle. Prior to your program, think of famous duos. These could be celebrity couples, food pairings, fictional characters – really any recognizable pair! Prepare a sticker for each guest with one-half of each pair. When you are ready to facilitate the activity, distribute each sticker and have each guest read the tag privately. Emphasize that they should not tell other guests what is written on the sticker. The goal is to find the guest who has the name tag that matches – who is the Jay Z to your Beyonce? Who is the peanut butter to your jelly? – by asking people “yes or no” questions. You can’t ask questions directly about the name of each identity because that is definitely cheating. As a host, you can pair people together who don’t know each other! This will create an instant moment for introduction and conversation, while also allowing the entire room to get to know one another. An activity from Reboot, Six Word Memoir presses participants to think about “the story of their life – all of it or a portion – told in exactly six words.” This activity would be perfect for a more calm atmosphere and needs limited preparation or supplies. Each participant only needs a piece of paper and a writing utensil. Check out the Six Word Memoir website with your group to see different examples, watch videos, and better understand the six word memoir story. What is my six word memoir, you ask? I’ll see you at the finish. Email me at liza.moskowitz@moishehouse.org if you want to hear why this is my six word memoir. But what if my friends are awkward (we still love them)? Sometimes conversation can’t be the epicenter of an activity. For our friends who are awkward or are on the shy side, prepare activities that make conversation a positive secondary outcome. Pretzel sticks. Marshmallows. Peanut Butter. Hershey’s Kisses. Need I say more? Make your own edible dreidls for everyone’s snacking pleasure! Google Hanukkah coloring pages and more than 3 million results are returned. I’m not kidding. Print out as many coloring sheets as your child-at-heart desires, and slip into a state or relaxation. Instead of standard origami paper, I recommend a 12 inch x 12 inch sheet of scrapbook paper. Stop by your local craft store to pick up fun prints, patterns, or colors for guest to choose from. 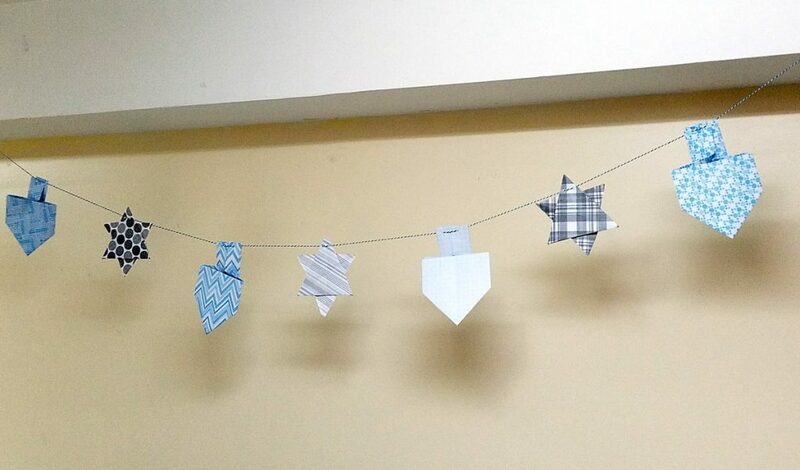 The link above has origami instructions for both a Star of David and dreidl to be hung up on a string for a festive garland. No matter which icebreaker format you choose, encourage your friends to mix and mingle. Get to know one another. Authentic relationships are the foundation to any successful community, so let’s end 2018 and start 2019 on the right foot.